Camden is a place bustling full of wonderful vegan friendly market stalls and restaurants, but I gotta tell you… It has been seriously missing an entirely Vegan Pizza Joint. However my prayers have now been answered in the form of a firm Brighton favourite, called Purezza – located right near Camden Town station. 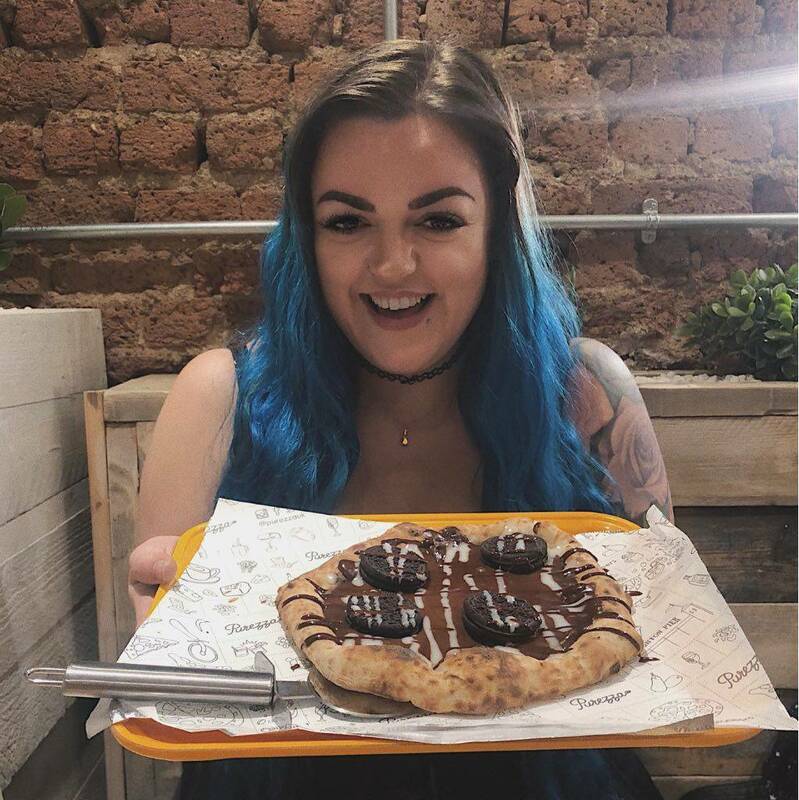 And, if the title of this blog didn’t give it away… They do a pretty sensational dessert that is a vegan pizza topped with an array chocolate sauce & Oreos (and an Oreo Milkshake too). 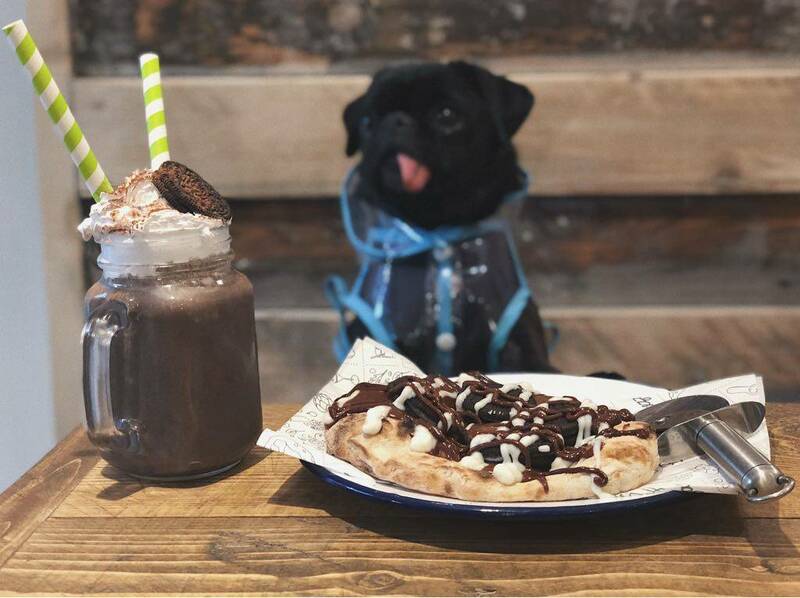 Suki the pug trying very hard to resist the Oreo Milkshake & Pizza! Now let me tell you something – this place is actually so much more than Oreo dessert pizza, but that was my ploy to hook you in and now I’m gunna make you stay for a hot vegan cheezy minute for the other amazing vegan dishes on offer: Mac N Cheese, Stuffed Dough Balls, Calzone, Cocktails, Freakshakes, and of course PIZZA! And a lot of it is available gluten-free, too! 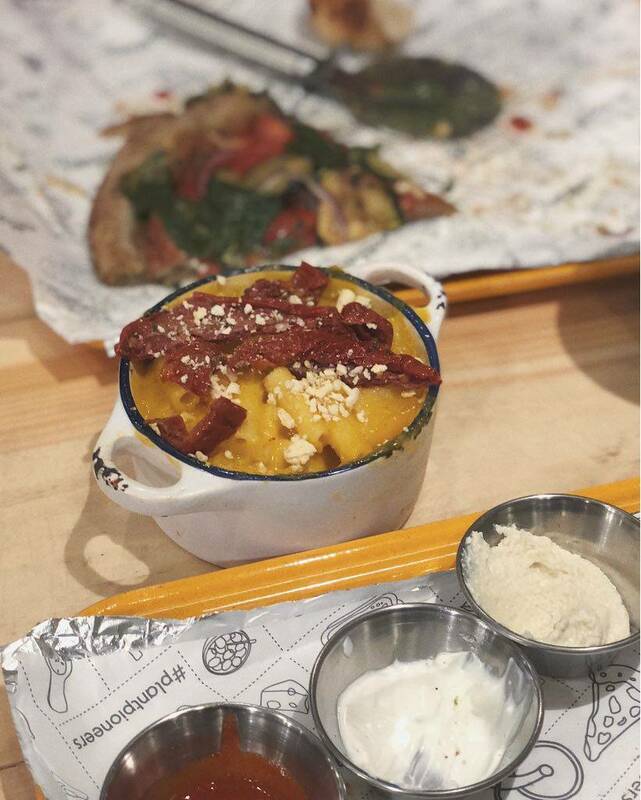 The Mac n Cheese (£5) is a strong contender for tastiest vegan Mac n Cheese that I’ve tried at a restaurant in London, and it’s gluten-free. I’m constantly on the hunt for a life changing vegan Mac n Cheese, and this certainly sets the bar high. It’s creamy and rich and you can have your dish topped with a selection of toppings too, including sun-dried tomato & tofu (£1 each). There are also delicious little cheese filled dough balls (£4) on the menu. I’ve had these both fresh at the restaurant and cooler after getting them to takeaway. Unlike regular “real cheese” filled dough balls – the cheese doesn’t harden when it cools. It’s still creamy and melty texture wise and all kinds of moreish. 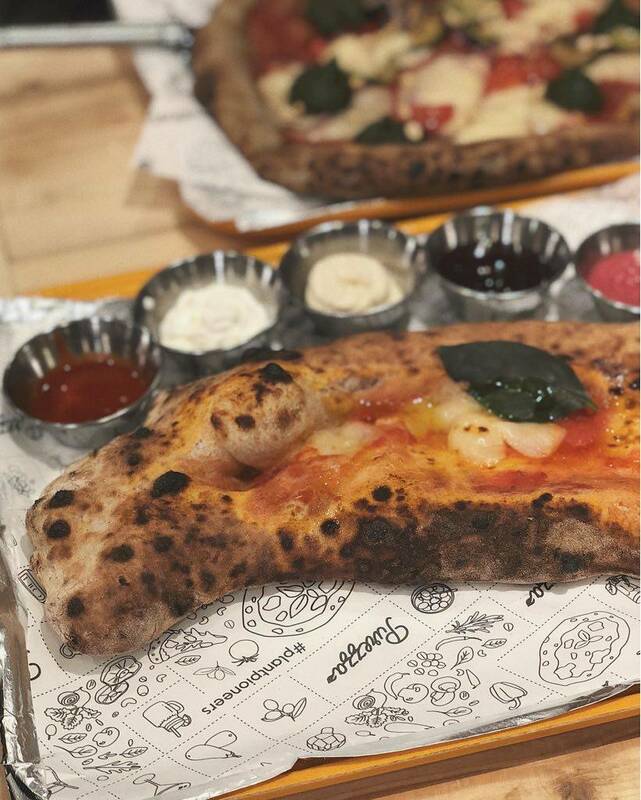 As a main course I went for the Calzone (£16), I’ve not had one in years and a folded up pizza (which to be honest is sorta like a burrito of the pizza world) is one of gods greatest gifts. Inside, this had caramelised onions, silken ricotta cheese, seitan, marinated chickpeas, spinach, and it was pretty delicious. My only qualm is that although it had a whole range of fillings, it could probably have been filled a little more, the filling to dough ratio was a bit off, although luckily I had a selection of dips to dunk into (each dip costs £1). My housemate Starzi had the Pesto Manifesto (£14.50) on a hemp sourdough (+£3.50) base. The toppings included red onions, courgettes, spinach, cherry tomatoes, pine nuts, and of course pesto – freshly blended in-house. The name of this one is a little political, so I gotta say, if I were choosing which party to vote for, the one with the ‘Pesto Manifesto’ would certainly get my vote (/order)… Yeah that was super cheesy, but I couldn’t help myself. 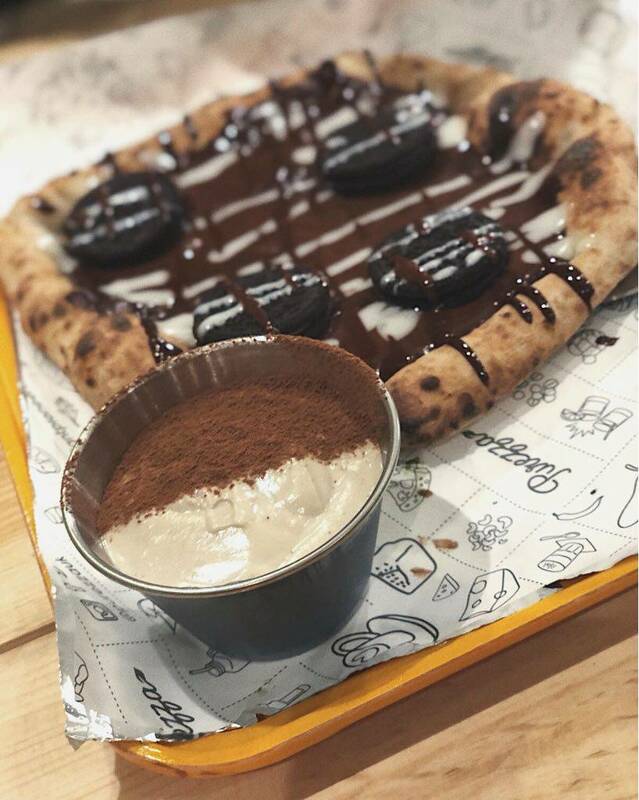 Now we’re here, the main event that you’ve been sticking around for… The OREO PIZZA (£5.85)! This was certainly an experience. I’ll be honest my eyes were much bigger than my stomach at this point and I had a small sliver and had to take the rest home to have the next day! The sauce on this is creamy hazelnut chocolate, as well as a drizzle of mascarpone style sauce, and of course – Oreos! They also serve a vegan, gluten-free Tiramisu (£5.85), which is a raw dessert made with dates, almonds, creamy cashews and cold brew coffee. Although I’m definitely not a coffee drinker I had a taste and I was surprised to find I didn’t actually mind too much. Drinks wise they have a whole range of vegan friendLY alcoholic and non-alcoholic beverages. I had a delicious ‘Purezza Spritz’ to accompany my meal. It’s their twist on a classic and contains: Aperol, Pear Cider, Gin, Organic Prosecco & a dash of plum juice. 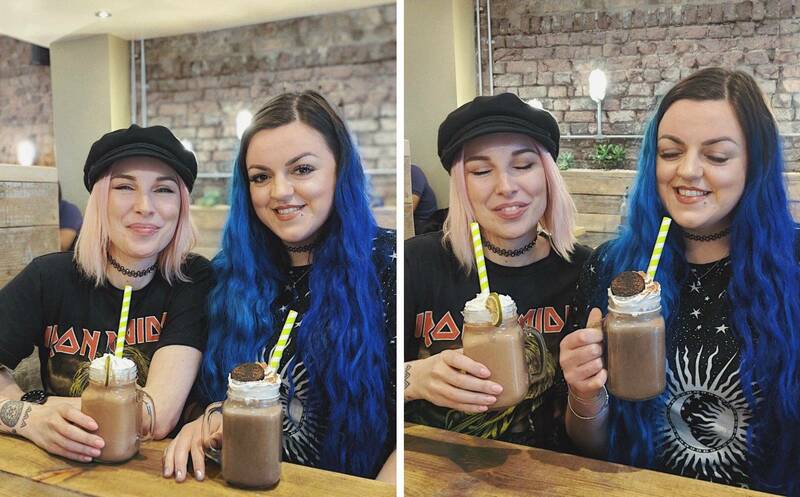 If a liquid dessert (or an American style meal with a huge shake to accompany your pizza) is what you’re after, you have got to try one of the Chocolate Oreo milkshakes. Made with almond milk, whipped cream and blended Oreo biscuits, plus one on top for good measure. They also serve two smoothies that can be made gluten-free, which Kitty has in the picture below! The icing on the cake about this place for me is that they’re now available on Deliveroo… although I don’t live far from the restaurant, sometimes you wanna stay in and order food, so it’s fab I can get some of their wonderful offerings delivered to my doorstep. So, next time you’re in North London and craving vegan pizza, I implore you to check this place out – the staff are friendly, the atmosphere is welcoming, and the food is damn good! Originally I went for the opening evening where I tried most of the food above free of charge. 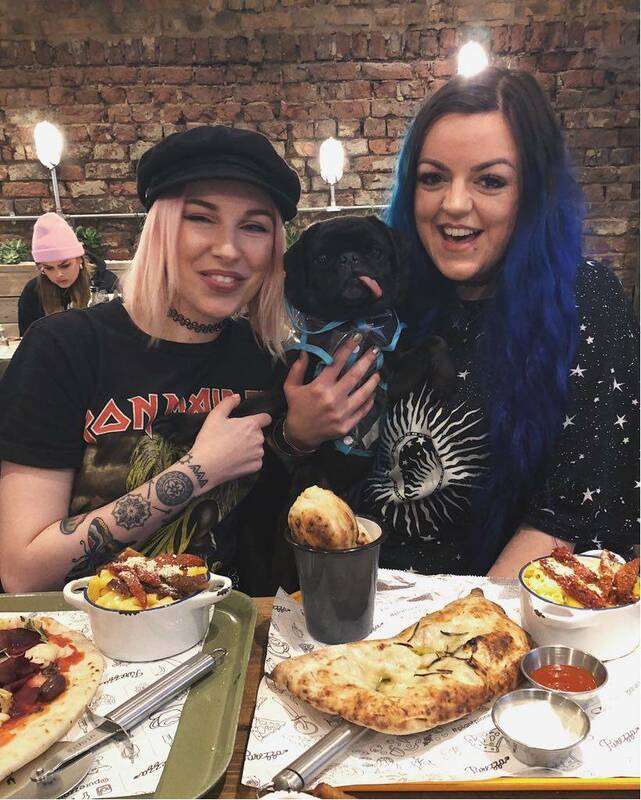 however I have since been back with Kitty, the adorable Suki the pug (and Suki’s owners Bradley & Mickey) as you can see in some these pics, as a full paying customer, and I have also ordered on Deliveroo. I definitely won’t hesitate to go back/order again for another feast v. soon! Thanks for setting up shop in Camden, Purezza – nice to have ya! 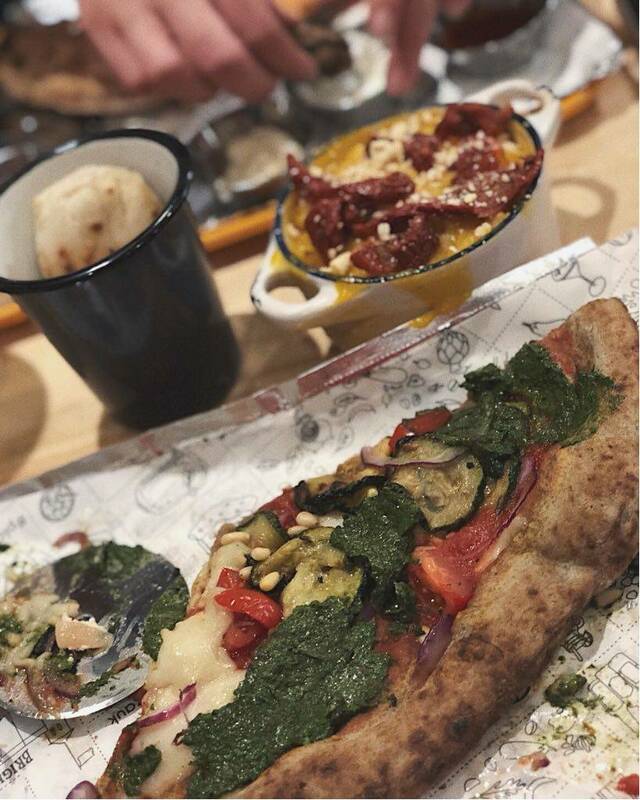 To see everything that’s on offer at Purezza Camden, check out their menu here. Next time I’ll be having the Cheesus pizza for sure! If you enjoyed this check out the vegan tab on my blog for more amazing vegan (& vegan options, at) restaurants in and around London!